The former manager of Mansfield Town, Duncan Russell, has died after a short battle with cancer. The club announced the news on Twitter. The 59-year-old took charge of 36 games for the Stags in 2010 & 2011. Russ, we will always remember you for leading us to Wembley, your good humour and determined spirit. May you rest in peace. Tributes have been paid to a young football academy physio who has died at the age of just 25. Matt Salmon who was from Leicester, was diagnosed with lung cancer in 2010, and had just announced his retirement from League Two side Mansfield Town on Wednesday following a consultation with doctors. He spent three and a half years at the Nottinghamshire club, including a stint as first team physiotherapist. Matt released the following statement on Wednesday as he announced his retirement. "I have immensely enjoyed every single moment since joining Mansfield Town, three-and-half years ago. Every single member of playing and coaching staff have been incredibly supportive of my situation and have always given me the opportunity to do the job that I love. "It has been an incredibly difficult decision to resign from my dream job at the age of 25 but unfortunately I have reached a stage where I am not able to give our players the level of care they deserve, something I have strived to do since I joined the club and made a minimum requirement for all medical staff who I've had the pleasure of working with. I will finish by wishing the club, players, staff and fans all the best for next season and I look forward to the club playing League One football, which everyone at the club deserves." This was Matt's final tweet from his official Twitter account on Wednesday as he retired from the club. 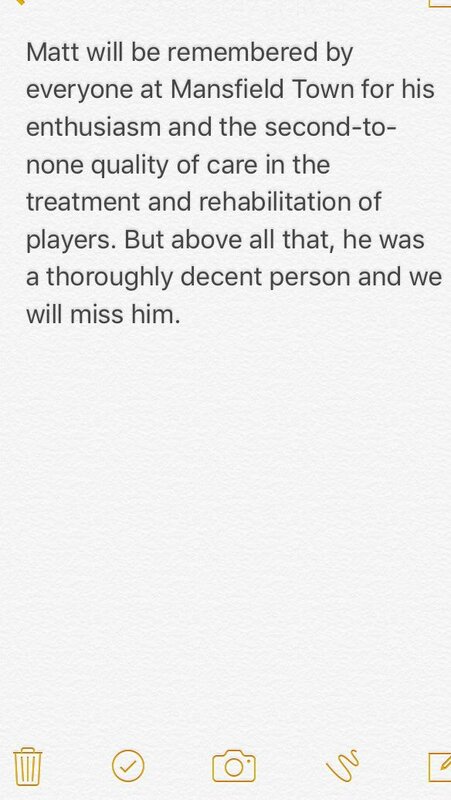 The club's chairman John Radford posted this tribute on Twitter. The Football Association are carrying out an investigation to ascertain whether a Mansfield Town striker urinated in front of supporters. Mansfield Town boss Adam Murray hit back at local reporters, by putting his son forward at a news conference today. F/T Mansfield Town 0 - 0 Chesterfield: Neither side can find a way through after a well contested game at the One Call Stadium. Chesterfield have drawn 0-0 away to East Midlands rivals Mansfield Town in today's 1pm kick-off. The result sees the Spireites go top of League Two on goal difference.